Automatic income for your jomsocial based website! Sounds like a good plan?! 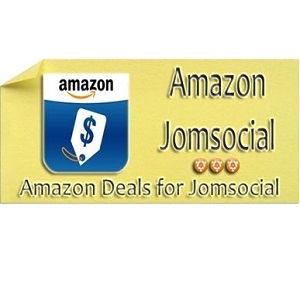 We are proud to announce that we integrated Amazon Deals network into jomsocial. Having steady revenue from jomsocial websites is now a breeze with Google Ads for Jomsocial, Groupon for Jomsocial and Amazon for Jomsocial. 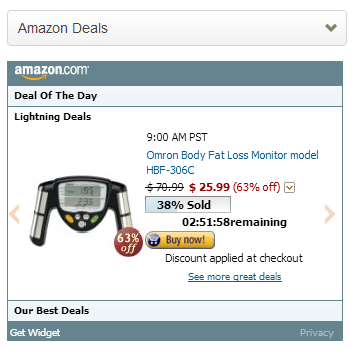 With Amazon Deals for Jomsocial you can display the hottest deals from amazon inside every user profile. But that's not all, Amazon for Jomsocial uses the native amazon API which allows you to display Gold Box Deals, Deals by Category (discount high, medium, low) and Warehouse Deals with very high discounts. You will be happy to know that you can display several ads sizes based on amazon api to better integrate in your jomsocial template. With the 3 above jomsocial extensions you can generate thousands of dollars per month, "must have" for any joomla webmaster or administrator. 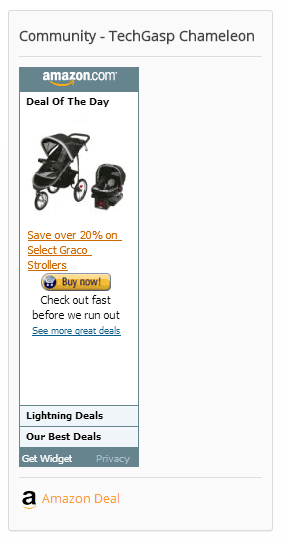 Amazon Deals for Jomsocial uses TechGasp Chameleon Framework for Jomsocial. It can be used as User Profile Plugin, Activity Stream Plugin and Jomsocial Module. Awesome 3 in 1!!! The download archive contains currently 3,525 Downloads in 331 Categories. To date, these have been downloaded 37,636 times.